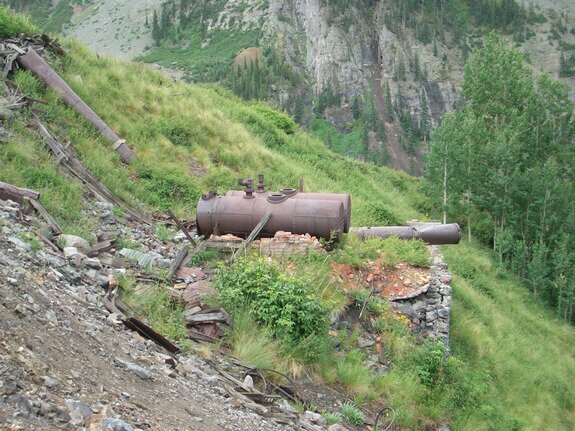 The Smuggler-Union mine used to be located along Tomboy Road high above Pandora (east of Telluride). 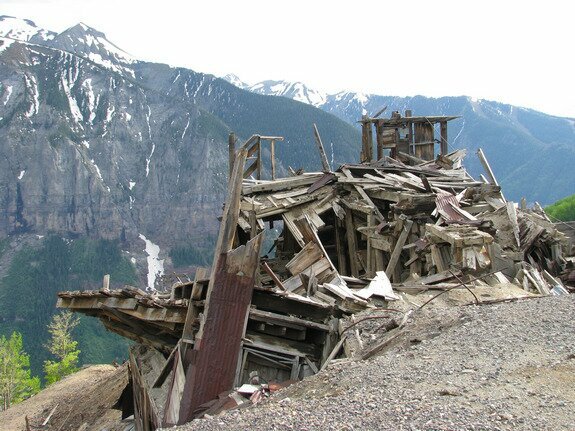 It was an amazing complex consisting of a multistory boarding house holding hundreds of men perched precariously closed to the edge of a cliff. Author Ken Jessen pointed out correctly that the entire boarding house is still there.. just not in one place. Most has slid down the mountain. An elaborate tram system carried ore down to Pandora, and remnants of steam boilers, chain, tram cable, and rusted piping are scattered throughout the area. 4WD is required to get to this site, yet it sits only feet away from the road. 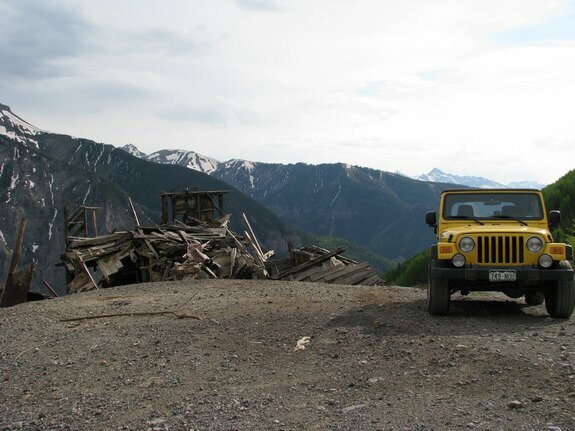 Originally, the mine portal was far above the road. The "Bullion" Tunnel was drilled as a crosscut underneath the mine in an effort to reduce operating costs. At one time, a Hay fire broken out near the mine portal. The draft sucked the smoke in and many miners died of smoke inhalation. Two boilers remain, with stone foundation outside them. There was, apparently, a boiler room here which has fallen away. Date Taken: 2007:07:19 12:30:58 Want to use this image? See the More information tab. Date Taken: 2008:06:23 17:48:10 Want to use this image? See the More information tab. Smuggler-Union Tunnel. While standing here, there is a steady cool breeze blowing out of this tunnel. Date Taken: 2008:06:23 17:48:49 Want to use this image? See the More information tab. 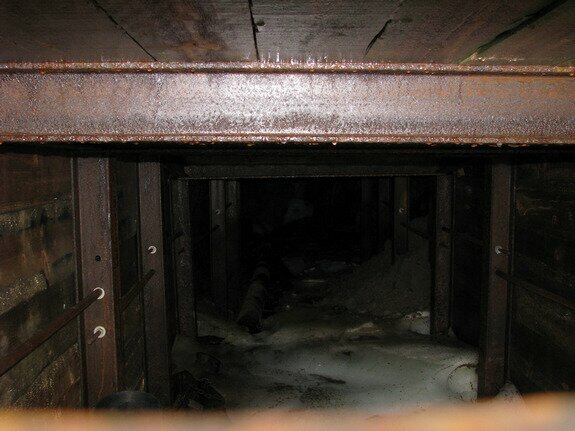 Looking closer, inside the tunnel. Date Taken: 2008:06:23 17:49:42 Want to use this image? See the More information tab. Date Taken: 2008:06:23 17:50:04 Want to use this image? See the More information tab. Closer view of the remains. 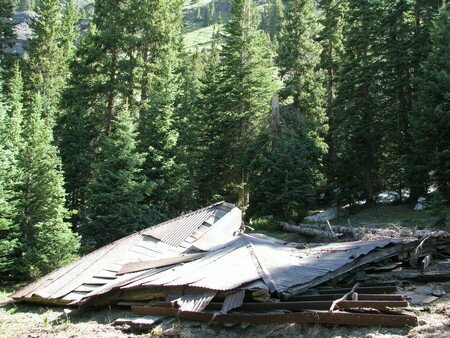 This is what is left of the Crusher house. Date Taken: 2008:06:23 17:50:14 Want to use this image? See the More information tab.